Used to destain our kitchen equipment and is fantastic, it's done the job; so we will be ordering the same product in future. Designed exclusively for use in kitchens and catering environments, our Gompels Sanitiser and Tannin Remover comes in a large and economic tub size. Developed to utilise chlorine release technology and effectively sanitise your crockery, tea urns and coffee pots, this powder formula also works hard against tannin based stains to bring back the original white finish of your most used items. It dissolves quickly in hot water and has an non perfumed so as not to taint food preparation surfaces or the food used on them. 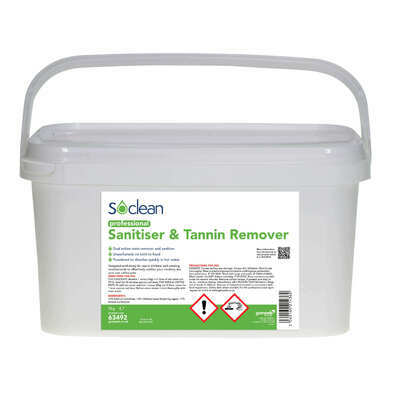 Suitable for use in all water conditions, the high quality sanitiser and tannin remover powder comes in a durable plastic tub with a handle for easy storage and transportation. Take a browse through our cleaning items today and stock up on products such as our Dish Brush, Gompels Professional Machine Dishwash or our Tea Towels - all available at exceptional wholesale prices.